Written to accompany British author John Bunyan’s famous 1628 religious allegory, this literature study guide by Sabrina Justison helps you get the most out of Pilgrim’s Progress. Literature study guides from 7SistersHomeschool.com inspire students rather than tire them with busywork that kills the story. Christian character development is important for homeschool teens. One of the best-selling books of all time, Pilgrim’s Progress is just as relevant today as it was almost 400 years ago. This book is a must-read for teens. This study guide challenges your homeschooler to grow personally and spiritually. 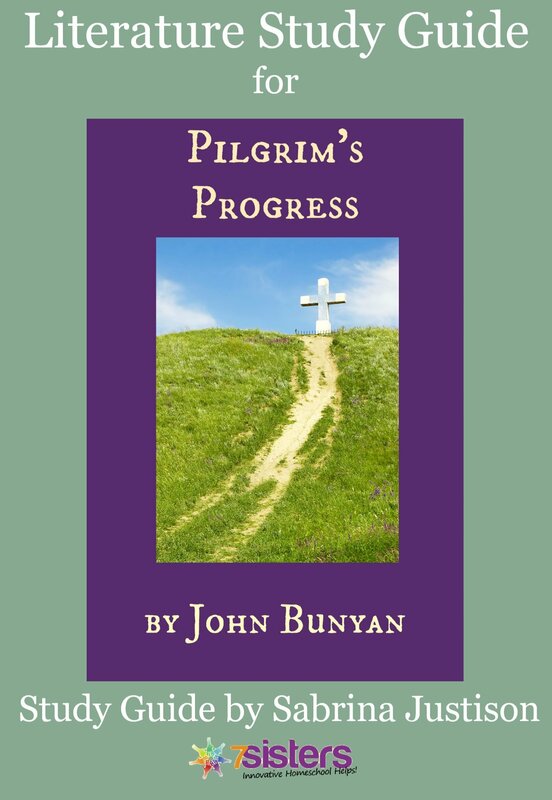 Pilgrim’s Progress: “nothing but sound & honest Gospel strains” – John Bunyan. This literature study guide is a bit different from most 7Sisters guides. The bulk of the “learning” comes from using the “notes for further discussion” which follow the question section. These facilitate digging deeper as the student writes a personal response to each section of text. Building inferential and application skills, this study guide moves beyond simple comprehension (as allegories naturally make comprehension easy) and encourages deep consideration of the text. This document contains fillable fields so students can type their answers directly into the guide. You will receive 2 downloads. One is for the student. The other is for you, the parent. In this particular guide, there is no actual answer key, however the Parent Info section allows you to read the same information that your student has in his/her section.